I've had my eye on the delightfully presented Bloom Gin for quite some time now; ever since it was recommended to me by my favourite purveyors of fine spirits and liqueurs at Amathus City. I was intrigued by it's list of botanicals that include, alongside the essential juniper; sweet honeysuckle, pomelo and chamomile. I was promised a delicate gin that sounded perfect for making the kind of floral and fresh cocktails that I love. Now don't get me wrong, I love a big, punchy gin as much as the next ginthusiast, but variety really is the spice of life and there's always room in the cocktail cabinet for another juniper based spirit and they really do vary. The only hard and fast rule, to which distillers must adhere when producing gin, is that the predominant flavour should be juniper, but otherwise, the options are infinite. The base spirit is generally a clear, grain spirit (vodka), but even that, needn't be the case, as Chase Distillers have proved, by producing a number of gins using apples from their orchards in Hereford. When it comes to botanicals, gin producers can get creative and no two brands will taste the same. Hendricks, for instance, uses a rose and cucumber infusion, Gin Mare is flavoured with olive and Blackwoods lists water mint and wild violet among it's ingredients, all of which give each gin their own, unique flavour. 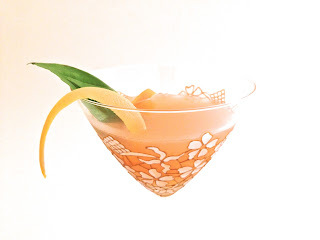 I named this cocktail 'Forbidden Fruit' because pink grapefruit, (which is a hybrid of pomelo and sweet orange) when first discovered in Barbados, was given that name. Having a very similar taste profile to pomelo, pink grapefruit is good choice to bring out the best of Bloom gin. It's sweeter than ordinary grapefruit and of course, it's a wonderful colour. I find that basil and pink grapefruit work remarkably well together, but basil is a powerful herb, so less is most definitely more in this case. Before cutting the pink grapefruit to squeeze it, first pare off a long strip of zest, ensuring to leave as much of the pith behind as is possible and set aside for garnishing the cocktail at the end. Add the gin, basil and pink grapefruit to a cocktail shaker and muddle gently to release the aroma from the basil. Remove the basil leave and discard before adding the agave syrup and a handful of ice. Shake hard until the outside of the shaker is completely frosted and then double strain into a chilled martini glass. Before garnishing, twist the zest over the drink to release a micro fine spray of citrus oil and gently slap the basil between your palms to allow the aroma of the herb to escape. This next cocktail makes me think of warm, mediterranean summers. The lemon and rosemary keep it fresh and light and I used Prosecco because it's a touch sweeter. You only need a little of the rosemary syrup, and the peachy citrus notes of the bubbles are perfect with this light and floral gin. Before cutting the lemon to squeeze it, first pare off a long strip of zest, ensuring to leave as much of the pith behind as is possible and set aside for garnishing the cocktail at the end. Add the gin, lemon and rosemary syrup to a cocktail shaker with a handful of ice and shake. Strain into a champagne flute and carefully top with Prosecco. Strip the lower needles from the sprig of rosemary and twist the lemon zest around the stem and garnish. This last cocktail was my personal favourite, not least because, as soon as I opened my bottle of Bloom Gin, I knew I wanted to make a cocktail that involved chamomile tea and the drink that I created in my head at that moment, worked perfectly. 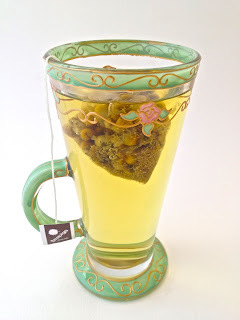 I wanted to use whole dried chamomile flowers to make the tea, but was unable to source them at short notice. However, to my delight, I discovered that teapigs chamomile tea temples are stocked in my local Tesco. Each little 'temple' contains a generous quantity of whole, dried chamomile flowers which brew up to produce a perfect cup of naturally sweet and golden tea. The teapigs website is well worth a visit if you are a fan of tea. It's fun, easy to use and they sell a myriad of loose and bagged, high quality teas. Pour around 200 ml of just boiled water into a cup containing a teapigs tea temple and allow to infuse for around 10 mins. Remove the chamomile and allow to cool before refrigerating until chilled. Add all of the ingredients to a shaker with ice and stir steadily until the outside of the shaker develops a frosty bloom. Strain the contents into an ice filled tumbler. Gently slap the sprig of mint between your palms to release the aroma and garnish the drink.